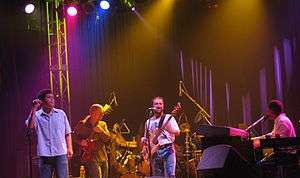 Jam bands are musical groups whose live albums and concerts relate to a unique fan culture that began in the 1960s with the Grateful Dead, and continued with The Allman Brothers Band, which had lengthy jams at concerts. The performances of these bands typically feature extended musical improvisation ("jams") over rhythmic grooves and chord patterns, and long sets of music that can often cross genre boundaries. The Grateful Dead continued to grow their fanbase in the second half of the 1980s. In the mid-1980s the bands Phish, Edie Brickell & New Bohemians, Blues Traveler, Ozric Tentacles, Widespread Panic, Bela Fleck and the Flecktones, Spin Doctors, Col Bruce Hampton and Aquarium Rescue Unit, began touring with Jam band-style concerts. In the early 1990s, a new generation of bands was spurred on by the Grateful Dead's touring and the increased exposure of The Black Crowes, Phish, Dave Matthews Band, Widespread Panic and Aquarium Rescue Unit. 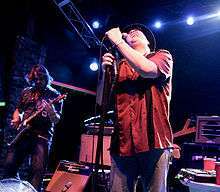 Many of today's jam bands have brought widely varied genres into the scene. A jam band festival may include bands with electronic, folk rock, blues rock, jazz fusion, psychedelic rock, southern rock, progressive rock, acid jazz, hip hop, hard rock, and bluegrass sounds. 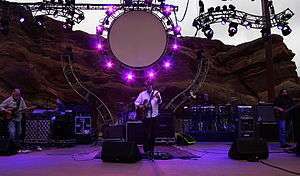 The electronic trend has been led by such bands as The Disco Biscuits, Sound Tribe Sector 9 (STS9), Lotus, EOTO, The New Deal. Bands like moe., Umphrey's McGee, Assembly of Dust, The Heavy Pets and The Breakfast have carried on the classic rock sound mixed with exploratory jams. Members of the Grateful Dead have continued touring in many different configurations as The Dead, Bob Weir & Ratdog, Phil Lesh and Friends, 7 Walkers, Furthur and Dead & Company. The contemporary jam scene has grown to encompass bands from a great diversity of musical genres. While the seminal group the Grateful Dead are categorized as psychedelic rock, by the 1990s the term "jam band" was being used for groups playing a variety of rock-related genres, including blues, country music, folk music, and funk. Today the term even includes some groups completely outside of rock, such as those playing world music, electronic music, progressive bluegrass, and jazz fusion. By the late 1990s, the types of jam bands had so grown that the term became quite broad. Although today the term may be used to describe nearly any cross-genre band, festival band, or improvisational band, the term retains an affinity to the unique fan culture inspired by the Grateful Dead and carried on by the likes of Phish. Some artists such as The Derek Trucks Band are known for resisting the jam band label. A unique feature of the jam band scene is fan taping or digital recording of live concerts. 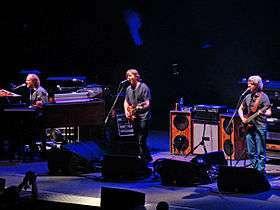 While many other styles of music term fan taping as "illegal bootlegging", jam bands often allow their fans to make tapes or recordings of their live shows. 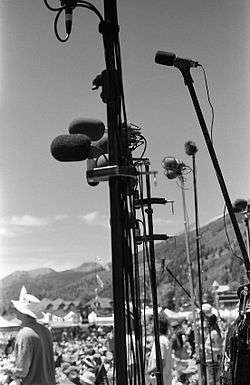 Fans trade recordings and collect recordings of different live shows because improvisational jam bands play their songs differently at each performance. By the 2000s, as internet downloading of MP3 music files became common, downloading of jam band songs became an extension of the cassette taping trend. Archived jam band downloads are available at various websites, the most prominent ones being etree and the Live Music Archive, which is part of the Internet Archive. More bands have been distributing their latest shows online. Bands such as Phish, Widespread Panic, The String Cheese Incident, Gov't Mule, ekoostik hookah, Umphrey's McGee, Lotus, and The Disco Biscuits have been offering digital downloads within days, or sometimes hours, of concerts. In the 1980s, the Grateful Dead's fan base included a large core group which followed their tours from show to show. These fans (who were known as "Deadheads") developed a sense of community and loyalty. In the 1990s, the band Phish began to attract this fan base. 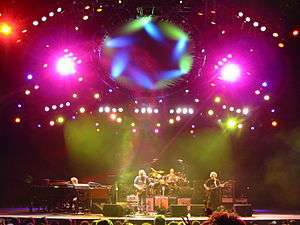 The term "jam band" was first used regarding Grateful Dead and Phish culture in the 1990s. Phish has become one of the largest listened to jam bands to this day. Phish has fans from all over the world coming from many different age groups. In 1998 Dean Budnick wrote the first book devoted to the subject, entitled Jam Bands. He founded Jambands.com later that year and he is often credited with coining the term. However, in his second book on the subject, 2004's Jambands: A Complete Guide to the Players, Music & Scene, he explains that he only popularized it. The band that set the template for future Jam bands was the Grateful Dead, founded in 1965 by legendary San Francisco-based guitarist Jerry Garcia. 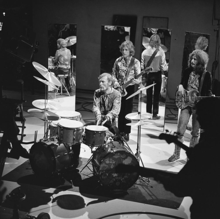 Although their studio albums enjoyed only modest success, and they were never an AM-radio favorite, "The Dead" attracted an enormous cult following, mainly on the strength of their live performances (and live albums). Drawing inspiration from Eric Clapton's short-lived (but influential) supergroup Cream, the band specialized, in concert, in improvisational jamming. They played long two-set shows, and gave their fans a different experience every night, with varying setlists, evolving songs, creative segues and extended instrumentals. Their loyal fans ("Deadheads") followed them on tour from city to city, and a hippie subculture developed around the band, complete with psychedelic clothes, a black market in concert-related products, and drug paraphernalia. The band toured regularly for nearly three decades, except for a hiatus from 1974-1976. The eventual heirs to this "Shakedown Street" fan culture, Phish, formed in 1983 at the University of Vermont in Burlington. They solidified their lineup in 1985, and began their career with a few Grateful Dead songs in their repertoire. The Allman Brothers Band were also considered a Jam band, particularly during the Duane Allman era. Songs such as "In Memory of Elizabeth Reed" and "Whipping Post", which were 5–7 minutes long on their studio albums, became 20 minute jams at concerts. The Allmans even performed a 34-minute jam with the Grateful Dead in 1970. Their 1972 album Eat A Peach included "Mountain Jam", a 34-minute instrumental that was recorded live. The 1971 live album At Fillmore East featured a 24-minute version of "Whipping Post", and a 20-minute version of Willie Cobb's "You Don't Love Me". Phish (along with the Grateful Dead, Bob Dylan, and The Beatles) was one of the first bands to have a Usenet newsgroup. To capitalize on this, they started trying out new theatrics at shows, such as the Big Ball Jam from 1992–1994, the Secret Language created in 1992 (03/06/92 - Portsmouth, NH), and the Audience Chess match, that lasted the entire 1995 tour. A rapidly expanding concert-going market in the early 1990s saw Phish playing mid-sized amphitheaters already in 1993 and 1994, with the band really starting to build momentum. The band also earned chances to play at various large venues, such as Madison Square Garden, by 1994's end. Many new bands were formed in the blooming scene. These were the first new bands to actually be called "jam bands", including ekoostik hookah, The Recipe, Dispatch, Gov't Mule, One-Eyed Jack, Leftover Salmon, Jambay, moe., Rusted Root and The String Cheese Incident. Phish held their first major music festival on 16 and 17 August 1996 in Plattsburgh, NY, which drew 70,000 "phans", and featured seven sets of music. This was the largest concert of the year, and Phish followed that up with similar-sized festivals in the Northeast in 1997, 1998, and 1999. Between 30 December 1999, and 1 January 2000, Phish held an enormous festival named "Big Cypress" in southern Florida, which concluded with an eight-hour set to begin the new millennium. The final shows before their breakup in 2004 were at the Coventry Festival in Vermont. As of 2015, Phish has played a total of ten multi-day camping festivals, the most recent being Magnaball in Watkins Glen, NY from Aug. 21-23. The success of these festivals led other bands to start their own festivals, notably the Disco Biscuits, who held their first Camp Bisco in 1999, and moe., which began its annual moe.down festivals in 2000. Many of today's jam bands have brought widely varied genres into the scene. A jam band festival may include bands with electronic, folk rock, blues rock, jazz fusion, psychedelic rock, southern rock, progressive rock, acid jazz, hip hop, hard rock, and bluegrass sounds. The electronic trend has been led by such bands as The Disco Biscuits, Sound Tribe Sector 9 (STS9), Lotus, EOTO, The New Deal. Bands like moe., Umphrey's McGee, Assembly of Dust, The Heavy Pets and The Breakfast have carried on the classic rock sound mixed with exploratory jams. 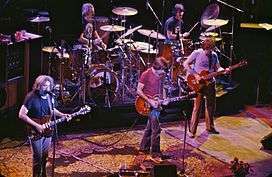 Members of the Grateful Dead have continued touring in many different configurations as The Dead, Bob Weir & Ratdog, Phil Lesh and Friends, 7 Walkers, and Furthur. Hundreds of jam-based festivals and concerts are held throughout the United States every year. The Bonnaroo Music Festival, held each June in Tennessee continues to provide a highly visible forum for jam acts, even though this festival has attracted many different genres during its decade-plus history. More bands have been distributing their latest shows online. Bands such as Phish, Widespread Panic, The String Cheese Incident, Gov't Mule, ekoostik hookah, Umphrey's McGee, Lotus, and The Disco Biscuits have been offering digital downloads within days, or sometimes hours, of concerts. The Grateful Dead have begun to offer online, digital download only, live releases from their archives as well. While there is some obvious conflict of interest between the "free and open trading of shows" and artists packaging and selling the same shows for money, a dynamic equilibrium has been reached where die-hards trade and others are happy to pay for the convenience. One way to see many jam bands in one place is by going to a jam band-oriented music festival. 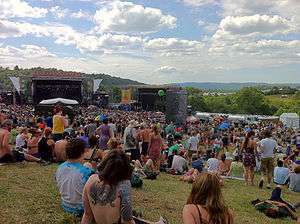 Some popular festivals that include jam bands are: Bonnaroo in Manchester, Tennessee; Gathering of the Vibes in Bridgeport, Connecticut; Rothbury Festival in Rothbury, Michigan (now known as Electric Forest Festival; The aforementioned High Sierra Music Festival in Quincy, California; All Good; Wakarusa Music and Camping Festival outside of Fayetteville, AR; Mountain Jam (festival) in Hunter Mt, New York; Telluride Bluegrass Festival in Colorado; The Werk Out Music Festival in Thornville, Ohio; and Summer Camp Music Festival in Chillicothe, Illinois. For a more comprehensive list, see List of jam bands. 1 2 3 "What is a jam band?". Jambands.com. Archived from the original on 2007-01-24. Retrieved 2007-02-02. 1 2 Relix, all issues. 1 2 Budnick, Dean (1998). Jam Bands: North America's Hottest Live Groups Plus How to Tape and Trade Their Shows. ECW Press. Retrieved 2013-07-23. ↑ Jambands, Dean Budnick, Backbeat Books, 2003, p. 241, JAMerica, p.79. ↑ "New Georgia Encyclopedia: Widespread Panic". Georgiaencyclopedia.org. Retrieved 2013-07-23. ↑ Santos, Rafael (30 October 2016). "The Internet gives publicity for new and emerging concepts". prezi.com. Retrieved 30 October 2016. 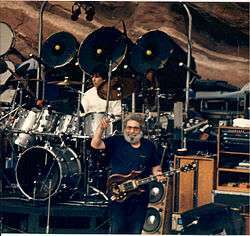 ↑ "7/5/95 Letter from the Grateful Dead". hake.com. Retrieved 2016-08-15. ↑ "Official Grateful Dead website". Dead.net website. Retrieved 10 August 2011. ↑ One such event was the Grateful Dead's playing of "Unbroken Chain," a song bass-player Phil Lesh penned (and sang), and a fan-favorite from the Dead's much-loved From The Mars Hotel (1974) LP, in their final year together. The re-emergence of their archetypal jam song "Dark Star" after years of absence from the repertoire is another such event. ↑ Fans will frequently wax rhapsodic about performances such as "that one show where Phish segued out of 'Fee', into 'Stash', into 'You Enjoy Myself', and then back into 'Stash' again." ↑ "Instant Live - It's better live | Live Nation Store". Store.livenation.com. Retrieved 2013-07-23. ↑ "Aderra Media - Live Music Recorded to MicroSD cards and Flash Drives CONCERT USB-FREE DOWNLOADS". Aderra.net. Retrieved 2013-07-23. ↑ Schultz, Mark F. (2006). "Fear and Norms and Rock & Roll: What Jambands Can Teach Us about Persuading People to Obey Copyright Law". Berkeley Technology Law Journal. 21: 651–728. Retrieved 25 December 2012. Wikimedia Commons has media related to Jam band.